Karin Fjällbäck-Holmgren was a Stockholm-based pioneer within social welfare, a suffragette, and a liberal politician. Karin Fjällbäck-Holmgren was born in Stockholm in 1881. Her father, Johan Alfred Fjällbäck, was an industrialist and a parliamentarian of the liberal party. Karin Fjällbäck-Holmgren gained her school-leaving certificate when she was 18 years old. She then continued her studies at Stockholm college and Uppsala university. By the time she was 22 years old, in 1903, she was already a member of the first board of the newly-established Centralförbund för socialt arbete (CSA) (national association for social welfare). The aim of the CSA was to serve as an umbrella organisation and coordinating centre for the various associations within social welfare, all of which were too separate to make truly effective contributions to counteract the poverty in Sweden caused by the impact of industrialisation. The CSA sought to coordinate these agencies to increase knowledge and opinion-forming, as well as to bring in reforms and new legislation within social welfare. Karin Fjällbäck-Holmgren’s involvement in social issues followed her throughout her various activities during her lifetime. As a member of CSA she also returned as a board member and head of office from 1918-1930. In 1906 Karin Fjällbäck-Holmgren married Nils Holmgren, soon-to-be Professor of zoology at Stockholm college. They had two children in quick succession, Kaj Holmgren and Pia Holmgren. However, maternity did not hold Karin Fjällbäck-Holmgren back from continuing her social and political activism. 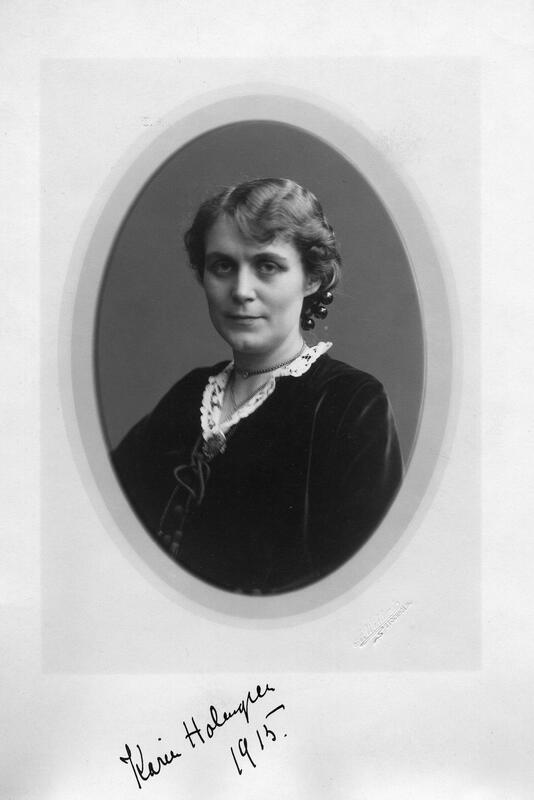 During the 1910s Karin Fjällbäck-Holmgren became secretary and deputy chair of the Stockholm section of Föreningen för kvinnans politiska rösträtt (FKPR) (association for women’s suffrage), a member of the board for Föreningen frisinnade kvinnor (association of liberal women), member of Stockholm liberal constituency association central board and executive committee, member of Frisinnade landsföreningens verställande utskott (executive committee of the national liberal association), member of the Swedish liberal party’s advisory council executive committee, and a member of the board for the Fredrika-Bremer association. As a municipal politician Karin Fjällbäck-Holmgren made her debut in 1914 on the poor relief board and pensions authority. In 1919, after the major municipal suffrage reforms allowed for broader female participation, she joined the corps of women who were active in Sweden’s municipal council meetings. A contemporary article in Idun, covering the new female presence in Stockholm’s municipal council, stated that Karin Fjällbäck-Holmgren “had already managed to make herself known as an unusually accomplished and astute speaker”, a reputation which the editors had also heard expressed “by men, which makes the word ‘astute’ particularly notable”. Over the ensuing decades Karin Fjällbäck-Holmgren maintained her municipal-political activism, initially in the Stockholm public-school directorate from 1924-1928, and somewhat later as deputy-chair of Stockholm city children’s welfare agency from 1931-1937. In addition to her political activism Karin Fjällbäck-Holmgren also taught techniques for running groups and municipal knowledge, undertook speaking tours around Sweden, and travelled abroad on study trips. Further, she published several articles and smaller pieces on social and political matters. She was recognised for her useful contributions to society by being awarded the royal Illis quorum medal. Karin Fjällbäck-Holmgren died in Stockholm in 1963. She is buried at the Norra cemetery in Solna. Katarina (Karin) Helena Fjällbäck-Holmgren, www.skbl.se/sv/artikel/KarinFjallbackHolmgren, Svenskt kvinnobiografiskt lexikon (article by Ulrika Holgersson), retrieved 2019-04-26.